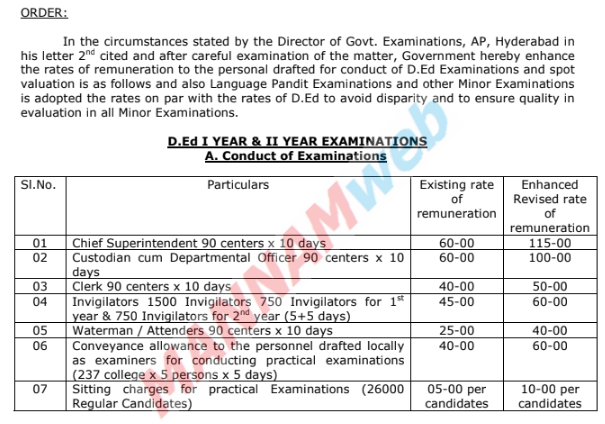 Education Dept – Enhancement of rates of remuneration to the Personnel drafted for conduct of D.Ed Examinations and spot valuation and also for Language Pandit Examinations and Other Minor Examinations – Orders – Issued. 2. From the DGE, AP, Hyd Lr.Rc.No.128/C1/2011 dated 09.04.2012 and 05.06.2012. 1.In the circumstances stated by the Director of Govt. Examinations, AP, Hyderabad in his letter 2nd cited and after careful examination of the matter, Government hereby enhance the rates of remuneration to the personal drafted for conduct of D.Ed Examinations and spot valuation is as follows and also Language Pandit Examinations and other Minor Examinations is adopted the rates on par with the rates of D.Ed to avoid disparity and to ensure quality in evaluation in all Minor Examinations. 2. The expenditure is debitable to the following Head of Account. 3. The above expenditure will be met from / within the budget provision of the O/o the DGE, AP, Hyd without any additional funds now or in future. 4. The Director of Govt. Examinations, AP, Hyderabad shall take necessary further action accordingly.